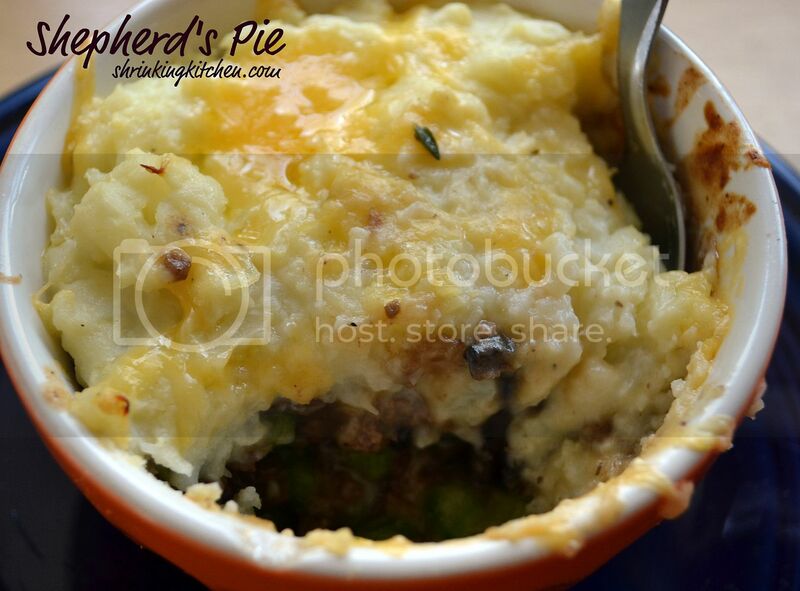 Shepherd’s Pie is traditionally made of ground meat and topped with full fat mashed potatoes. Our version uses a little lean ground beef paired with a bunch of mushrooms to give it a meaty feel and taste without all the calories. Another secret? The ‘mashed potatoes’ are only half potato. The other half is mashed cauliflower. I won’t tell if you won’t. I prepared this recipe in ramekins for easy portion control. Plus, it was fun to tell my son he was getting his own special ‘mashed potato pie’. If you’re craving something warm and comforting in your belly that won’t give you one – give this a try! Place the potatoes and cauliflower in a pot of water and bring to a boil. Boil the cauliflower and potatoes till fork tender, drain. Put the drained potato and cauliflower back into the cooking pot and place back over heat (this will allow excess water to evaporate while you mash the vegetables). Add the cream cheese and butter, and mash well. A few lumps are fine. Go with your preference. Salt and pepper the pototo/cauliflower mash to taste and set aside. Heat olive oil in nonstick skillet over medium heat. Add onions and carrots and saute for a few minutes till the onions are softened. Add the ground beef and brown while breaking up with a spatula. When the beef is nearly brown, add the mushrooms. Cook until soft, then add the peas. Add the flour and mix into the beef mixture. When the flour is well incorporated, add the beef broth and bring to a simmer while stirring. The mixture will thicken. Spoon the meat mixture equally into four ramekins. Top with meat mixture with the potato/cauliflower mixture. Sprinkle lightly with low fat cheddar cheese. Bake for about 15 minutes until bubbling at the edges and the cheese is melted and golden. Allow to cool for a few minutes, then dig in! This recipe could easily be made in a regular casserole dish, no ramekins necessary, but it does help with portion control. This recipe is Feingold Stage 1 friendly using approved ingredients as listed in the food list. I cannot wait to try this! Love that you used cauliflower with the potatoes!! Absolutely love this recipe! 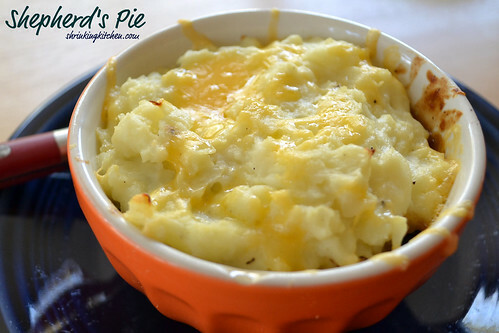 We have recently begun the Feingold diet and made this as one of the first recipes we tried. My kids, who don’t eat a lot of vegetables, even said this was delicious! !